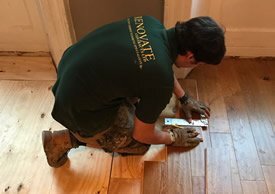 We chemically cleaned both floor surfaces, replaced and filled any damaged blocks. With the floor surface now intact we abraded the existing Granguard and then vacuumed the floor . Alter and make good the court markings in the sports hall. 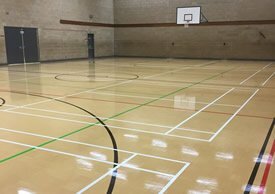 We then applied two coats of Granguard to both floor surfaces, this gives the floor the correct amount of traction & makes cleaning and maintenance easier and improves the appearance of the floor.